Which Diaper System Should I Choose? There are so many kinds of cloth diapers out there, it can be difficult to choose which system will work best for your family. You research and research and finally decide, Yes! I will cloth diaper my children. Then, you are faced with which diapers to buy! It can be overwhelming trying to figure out the pros and cons of each system, especially since you’ll be pulling from individual diaper reviews and diaper sites. I often get asked why I chose what I chose, why I like my diapers, and would I choose again the same way if I had to do it all over again. Well, here is an overview of different styles of cloth diapers and what I think is nice about them and what I think is awful about them. + They are the cheapest system available. + They provide a level of excitement, providing the daily challenge of achieving that perfect fold. – They are the most intimidating system, especially to husbands and child care providers. – Can be difficult to get the absorbency just right. – Can be difficult to get on a squirmy baby or toddler. + Cute and often trim. + Very absorbent and usually require little “fiddling” to get absorbency right. + Can easily use all natural fibers only. + Can make yourself or buy from a work at home mom. +/- Can be the most expensive system or a very affordable system depending on your personal choices. – More difficult to adjust absorbency if the absorbency isn’t right for your little one from the start. – Take more time to dry. + Most common type of One Size diapers. + Easy to adjust absorbency. + Only require one diaper “layer.” No extra cover is needed. – Require “assembly” of diapers after each wash.
– Usually made of man made fibers. – Can be expensive, depending on the diaper you choose. + Easy to use. Easy for you. Easy for husbands. Easy for child care providers. + No assembly required. Ready straight from the wash.
+ Only one diaper “layer” is needed. No extra cover necessary. – Can take quite a while to dry. – More difficult to adjust absorbency if you need to. – Can be quite expensive. + Fairly easy to use. + Dry faster than all-in-ones. 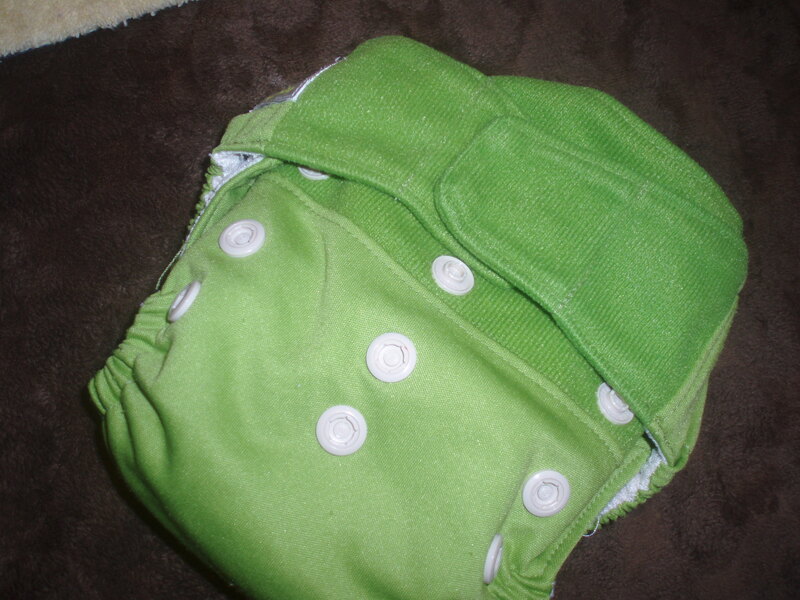 + Theoretically, you can reuse the outer cover, meaning you’ll have less diaper laundry and less cost. – Require “assembly” before use. What to do with all this information? Well, I looked at everything and narrowed down the most important for me. I knew I would be drying my diapers in my dryer, so I’d want something that dried quickly. I knew I needed something that would work immediately without a lot of trial and error. The Pastor was barely on board with cloth diapering, so I needed it to work and be easy for him. I wanted a one size solution, since I have multiple children in diapers at one time, I didn’t want to have to separate and keep several different sizes out all the time. I just needed one stash for all the children I was diapering (except newborns). I did not want to use snappis or pins. So, with all that information, I chose to buy one size pocket diapers. They worked without any playing around with them. They were easy to use. The only real downside for my family is that I have to assemble them when they come out of the dryer and that takes time. I have since used every other system, except prefolds. I can say, I can find things I like and don’t like about them all. If I had to do it over again, I would have bought less variety and tried to stick with one brand. (Having a bazillion brands makes it difficult when you are assembling your diapers. It also makes it difficult on care providers to switch from one brand to another, when they aren’t really comfortable with my diapers to begin with.) I love fitteds and covers for the newborn stage! I really dislike all-in-twos. So, what should I choose? That is up to you. You shouldn’t feel like you have to choose just one system. I knew that in the beginning, it would make it easier for The Pastor if I only had one system. But many families use on system at home and one system while out. Or one system during the day and another at night. Choosing an easier system at first will make your transition into cloth easier. (Some people find prefolds very frustrating and quit cloth diapering because of these frustrations.) It is up to you! A note about one size diapers: I often find that I would have probably liked sized diapers, too. 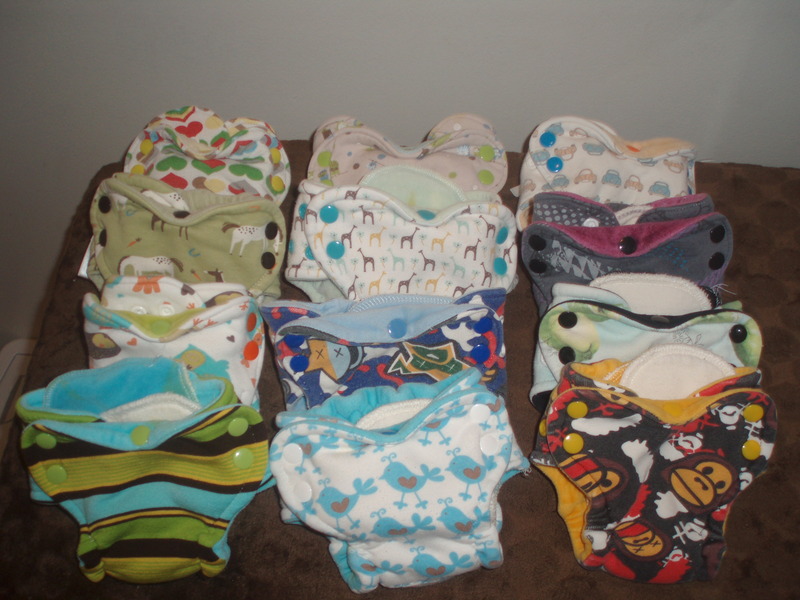 There are several brands of one size diapers that require internal adjustment of either the diaper or the insert, that defeat my “one stash” goal. 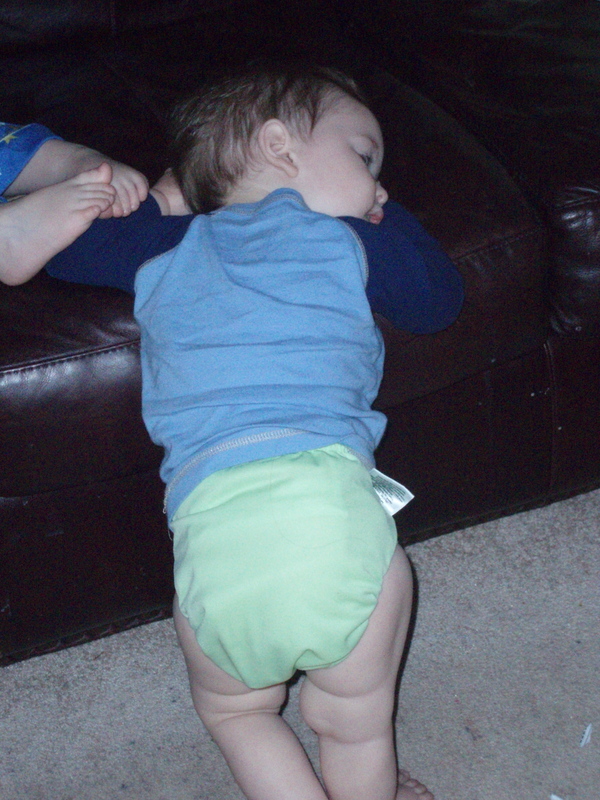 Also, diapers don’t last forever, so with one size diapers now on their third bum, I find they get very worn out. It might have been just the same to buy the various sizes and end up with more diapers, lasting longer. As it is, I must replace my diapers when they’ve had enough. I once thought one size diapers would save me money, and if I had one child, they would. But since I’ve now cloth diapered 3, I find that I would have spent the same, either way.